This stunning parson dining chair from Monarch Specialties is a stylish addition to any dining room table. Featuring a brown faux leather seat and brown leather wood frame, this chair is durable enough for a busy kitchen, yet elegant enough for a more formal setting. This beautiful slat back dining chair from Corliving brings a touch of style and elegance to any dining room table. Designed with a beige faux leather seat and brown solid wood frame, this chair can fit easily into a busy kitchen or a stylish dining area. Designed with style and practicality in mind, the Monarch Specialties parson dining chair is sure to be a great addition to any dining table. Its brown seat and sturdy frame give it an elegant, yet strong practicality that suits a variety of spaces. This beautiful parson dining chair from Monarch Specialties brings a touch of style and elegance to any dining room table. Its white seat and sturdy frame give it an elegant, yet strong practicality that suits a variety of spaces. 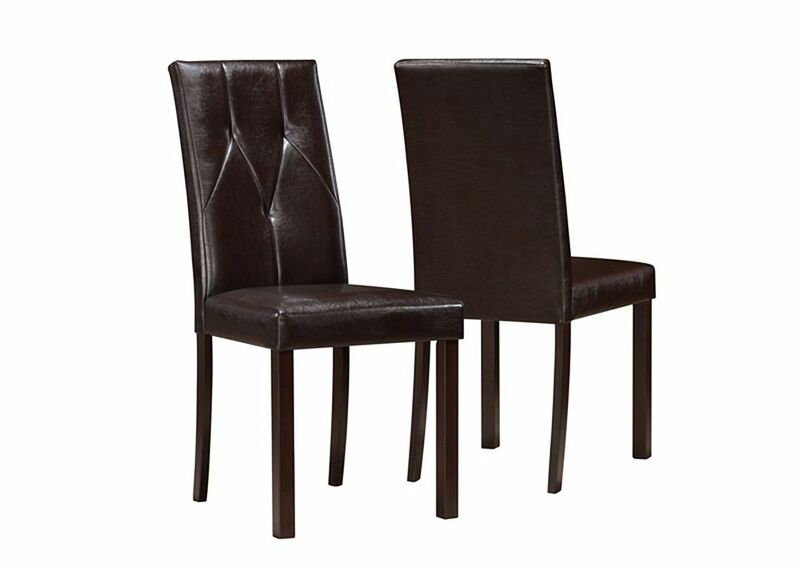 Create a casual, modern fashion statement in your dining area with this set of two ivory leather-look dining chairs. Featuring generously padded cushioning, sturdy solid wood legs in a dark brown finish, and an easy to clean leather-look upholstery. These dining chairs are built for comfort and convenience. Leather Wood Brown Parson Armless Dining Chair with Brown Faux Leather Seat - Set of 2 This stunning parson dining chair from Monarch Specialties is a stylish addition to any dining room table. Featuring a brown faux leather seat and brown leather wood frame, this chair is durable enough for a busy kitchen, yet elegant enough for a more formal setting.